This page is a guide to the cultural and historical details seen in the first Rurouni Kenshin OVA series released in the US as Samurai X Trust and Betrayal. This title is also available in a director's cut that is the full work as one film, I recommend this version as it is complete without the breaks between the secions. The structure of this page is simple first a list of all the details for each OVA in the order in which they appear and then, for the ones I have information for, in categories by type. The items in bold with page numbers refer to entries in two of my books The Anime Companion and The Anime Companion 2, links go to Anime Companion supplement entries for newer items. I also have a webpage listing some Books on the Bakumatsu and Early Meiji  with links to reviews I have written. You can also get an idea of how I write the entries in the supplement by the number of items which are simple descriptions and have no information. What I do is watch an anime and take notes of what I see and hear, often pretty sloppy notes, occasionally with the time something happens on a tape. Then I add the notes to a list of potential items to research and when I have an entry from anime or manga with information from a reliable secondary source I can do an addition to the supplement. In many cases, some very surprising, I don't find any good secondary information so I just wait until I stumble across something reliable. This page is also a special supplement to two of my books The Anime Companion and The Anime Companion 2, for information on ordering the books see the web pages for Stone Bridge Press. 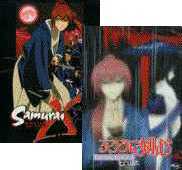 The early DVD releases of this title, both the two disc OVA release and the Directors Cut, have reversable covers. 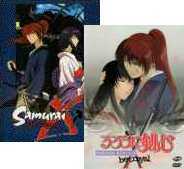 They ship with the "Samurai X" cover visible, on the other side is the Rurouni Kenshin cover. Simply open the case and remove the cover from the sleeve, then reverse it and you have a Rurouni Kenshin cover. Use these to determine where entries are. Act 1: "The Man of The Slashing Sword"
Act 2: "The Lost Cat"
Act 3 "The Previous Night at the Mountain Home"
Act 4 "The Cross Shaped Wound"
Thanks to Julie Lim for letting me know about this page. Due to my own standard of relying on reputable print material, plus my non-existent skills with Japanese, I have not been able to find much on this person. "Though I die and my body decays in the fields of Musashi, my Japanese spirit will live on"
Stone stairway tree lined with bamboo grove at base, perhaps stairs at Jakko-in?